At least 4 civilians were killed and more than 20 others were injured after a bomb-laden vehicle exploded at a marketplace in northwestern Syrian town of Afrin. Anadolu Agency reported that the blast also damaged shops in the area and the White Helmets units have launched a search and rescue and firefighting operation amid rubbles. The wounded were transferred to nearby hospitals. Security forces tightened their precautions in the area. 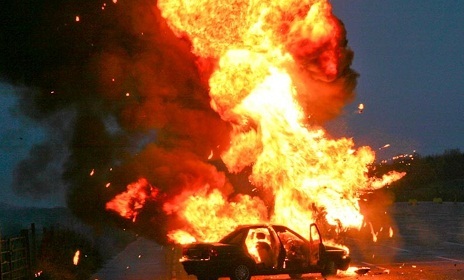 Another bomb-laden vehicle was discovered on street in the town center and was difused by bomb squads. Afrin district was cleared from PKK-affiliated People's Protection Units (YPG) terrorists by the Turkish Armed Forces (TSK) and the Free Syrian Army (FSA) units in Operation Olive Branch launched in Jan. 2018. Since Wednesday, when President Recep Tayyip Erdoğan announced that Turkey will soon launch an operation into Syria to clear east of the Euphrates River from YPG terrorists, at least 7 civilians were killed and 49 civilians were injured in terror attacks in northern Syrian town of Azaz controlled by the TSK and the FSA. The area was leared from Daesh terrorists in Operation Euphrates Shield launched in Aug. 2016.